I just finished reading Shop Class as Soulcraft by Matthew B. Crawford, and it struck me that he would probably be a big fan of camp. The book is an argument for working with your hands, for engaging the material world as opposed to the more abstract constructions of modern life (think TV, all forms of digital entertainment, even the work of most “white collar” jobs). The ordinary lives of most Americans, including our kids, are too often divorced from the joys of working with real things and with real people, and as a result our relationships suffer and we find ourselves dissatisfied. Crawford suggests working with our hands, enhancing our “manual competence,” can serve as an effective antidote to this modern affliction. You’ve probably heard of “Nature Deficit Disorder,” a concept fashioned by Richard Louv describing the negative consequences of children spending too little time in the outdoors. Here we have a similar notion linking negative effects to living a life abstracted from the sensuous, physical nature of the real world. 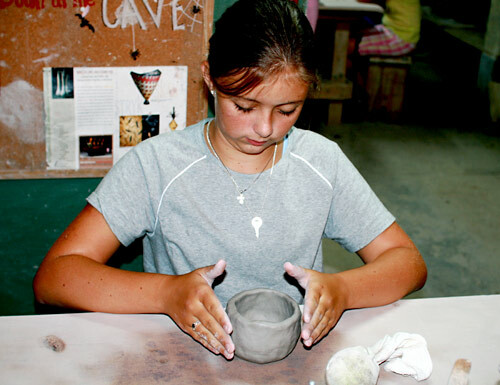 And just as it’s a response to Nature Deficit Disorder, summer camp provides children a wide range of opportunities to work with their hands, to make things and explore the real world (including the people around them!). Every day of life at camp challenges kids to do things with their hands, to actively engage the material world, whether it be building a clay mug, learning a flip off the diving board, or dressing up like an old lady to play bingo with your friends and laughing your head off. Crawford doesn’t talk much in his book about children, and not at all about summer camp, but if you know anything about camp life, you can easily see how it also serves children well in their development of “manual competence.” Kids love camp, and they’ll tell you that it’s because it’s simply “a lot of fun,” but maybe a large part of that can also be traced to their need to connect to the physical world. After all, camp is exactly that.